Tetracycline is an inexpensive antibiotic. It treats a wide range of bacterial disease. The drug is active against many microorganisms. It includes gram-positive, gram-negative bacteria and others. It was discovered in the 1940s. It shows favorable antimicrobial properties. The drug will not work for viral infections like common cold, flu etc. or others. The commercial use of tetracycline started in 1978. It is one of the most effective and safe medicines needed in a health system. Tetracycline is in the class of medications called as tetracycline antibiotics. They are protein synthesis inhibitor. The drug binds to the 30S ribosome of the bacteria. This prevents the attachment of the amino acyl tRNA to the RNA ribosome complex. The overall effects lead to inhibit the synthesis of protein in the bacterial cell. Protein an essential component of the bacterial cell to grow. Without protein, the growth, and multiplication of bacterial cell is stopped. Finally, it leads to the death of the cell and the infection stops to spread further. Response to the first dose. Usual dose: – 500 mg two times in a day or 250 mg four times in a day. Maximum dose: – 1 to 2 grams in a day. < 8 years of age – safety and efficacy not established. > 8 years of age – 25 to 50 mg/kg of body weight divided into 4 equal doses. Continue the therapy for at least 24 to 48 hours. Complete the dose though the symptoms and fever have subsided. Drink adequate amount of fluid to wash down the drug. This reduces the risk of esophageal irritation and ulceration. Certain constituents interfere with the use of these products e.g. Antacids containing calcium, iron, some dairy products etc. Tetracycline treats a wide range of bacterial infections. Sometimes used with other medications to treat stomach ulcers. Stops growth & multiplication of bacterial cell. This helps to cure disease. It is treats infections due to direct contact with infected animals or contaminated food. 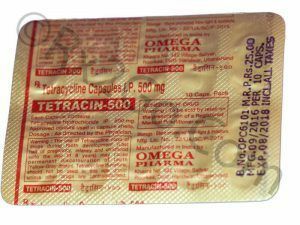 What are the precautions in taking tetracycline? Medical history of esophagus problems. Avoid live bacterial vaccination. It may not work as well. Limit your time in the sun. Use sun protection method. Don’t use the medication in children below 8 years. be cautious when you drive or use heavy machinery. The drug may make you feel dizzy. A generic drug is very same as a brand named drug. They work in the same way. It provide same clinical advantages as the brand ones. But the generic medicines are cheaper. So it is beneficial to use generic medicines as compared to brand ones. Pack of 60 capsules of 250 mg costs $ 12, per unit cost is $ 0.2. Pack of 60 capsules of 500 mg costs $ 13, per unit cost is $ 0.22. Pack of 60 capsules of 250 mg costs $ 69, per unit cost is $ 1.15. Pack of 60 capsules of 500 mg costs $ 78.90, per unit cost is $ 1.32.